Used with Permission, Copyright by Galaxy Bookshop. 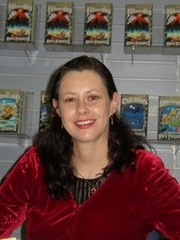 Internationally best selling fantasy and historical author Kate Forsyth is the author of 20 books including the Witches of Eileanan and Rhiannon's Ride series, Bitter Greens and many others. The Wild Girl is a riveting historical love story - the untold story of Dorchen Wild who grew up next to the Grimm Brothers and told them many of the compelling tales. Join us for a glass of champagne with Kate Forsyth on Wednesday, 13th March at 6:00 p.m. Growing up next door to the Grimm brothers in Hesse-Cassel, a small German kingdom, Dortchen Wild was the source of some of the most powerful and compelling stories in the famous fairy tale collection, and the true love of Wilhelm Grimm. This is their dramatic and passionate story - one of the greatest untold love stories in history. Set during the French Revolution, a time of war and poverty under Napoleon’s occupation, The Wild Girl tells the story of two poor neighbouring families, the Grimms and the Wilds. As an act of defiance to the occupation, the Grimm brothers began collecting old stories from neighbours and friends with an aim to publish a book and preserve some of the German folklore. The greatest of these sources was Dortchen Wild, she told Wilhelm the tales of The Frog King, Hansel and Gretel and Rumpelstiltskin among others. Wilhelm and Dortchen fell in love, but due to her overbearing and abusive fatherand both families extreme poverty, they were unable to marry. Their only chance to be together rested on the success of the story collection. Kate Forsyth is currently considered a "single author." If one or more works are by a distinct, homonymous authors, go ahead and split the author. Kate Forsyth is composed of 4 names. You can examine and separate out names.